As the industry grows, farmland usage is being intensified. Over 100 million tonnes of cattle, sheep and horse dung pile up every year. The run-off is steadily degrading our waterways, while the residual mess is infecting our animals and impoverishing our pastures. 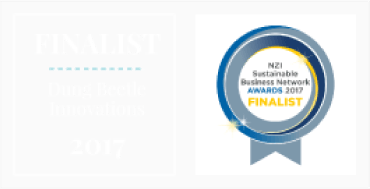 Dung beetles offer a remarkable natural sustainable solution to revitalise our soils and pastures, and can rehabilitate New Zealand’s waterways in as little as 23 years – if we act now. Sometimes Nature knows what’s best. In this case, it’s the humble dung beetle, evolved over millions of years. New Zealand’s pastoral farming systems is all good news! Try these links next… or simply explore our menu options.